This problem is caused for using a CDKey that is not supported for the Game/Server in FEAR Combat and FEAR (Included the Steam Version). The Steam Version of the game doesn’t officially support Multiplayer but It works! 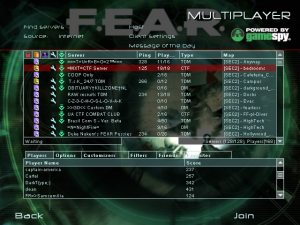 1) Get a FEAR Combat Community CDKey, registering at this site. 2) Install the FEAR Combat Patch, It will create the file once you type your CDKey ingame. You can Optionally Create the key.ini file manually and add your CDKey, but that’s not really needed, the patch takes care of this. 2) Change your FEAR COmbat CDKey to the one you got.